A backing bean is a special case of managed bean that has a one-to-one relationship to a single JSF page, and it exposes setter and getter methods for the components contained on the page. In Jdeveloper you can automatically expose UI components in a new bean when you create a new page by setting the Automatically Expose New UI Components in a New Managed Bean option as shown in the figure below. But imagine you forget to set this option and later you decided to create a Backing Bean, do you need to explicitly bind each component to the backing bean? 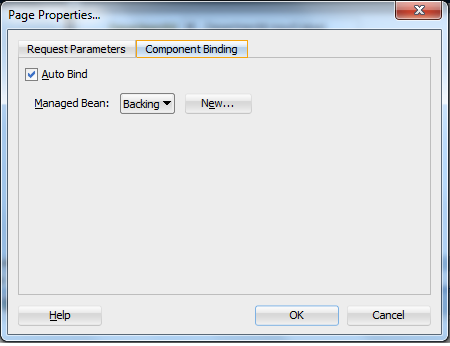 Click on the page properties and then select the Component Binding tab from the page properties window, set the Auto Bind option, and create or select an existing managed bean. The inputDate component creates a text field for entering dates and (optionally) a glyph which opens a popup for picking dates from a calendar. However in some cases we need to prevent the user from picking a specific days from the calender. In this post I will explain how to do this use case. 1- Create a simple JSF page and drag and drop af:inputDate component from the component palette into the newly created page. 2- Create a java class which implements org.apache.myfaces.trinidad.model.DateListProvider interface. This interface is used for providing a list of individual dates within a given range. 3- Override the getDateList method, This method will generate a List of individual Date objects which will be rendered as disabled in a datePicker component. An example is shown below. 4-Register the Java Class as Managed Bean in adfc-config.xml file. 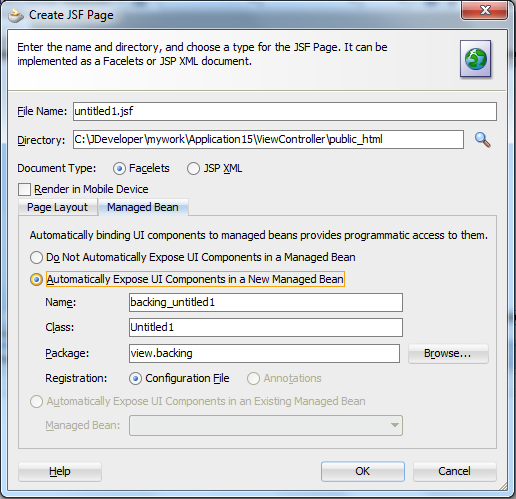 5- Go to the JSF page and select the inputDate component, from the property inspector select the DisabledDays property and bind it to the manged bean defined in the previous step. this binding requires periodic roundtrips. If you just want to disable certain weekdays (e.g. Saturday and Sunday), use the disabledDaysOfWeek attribute! 6- Run the page, and check that the date is disabled. Moreover, if the user enters the date manually without using the date picker, an error message will be shown to the user. Please change the file extension to .zip or .rar after download. Today, I took the Oracle Application Development Framework 11g Essentials exam (1Z0-554). Fortunately I passed it, and I am now an Application Development Framework Implementation specialist.